Residents at our care home in Neath were delighted to meet HRH Prince of Wales when he popped in for a visit last Friday 22nd February. Plas Bryn Rhosyn was chosen to host the visit as part of its association with Age Cymru’s cARTrefu project. Prince Charles met and chatted with residents and learnt more about how the cARTrefu project is making a difference by engaging residents in art and creativity. He spent a good hour meeting residents, sharing stories and had many laughs over tea and biscuits. Plas Bryn Rhosyn’s Manager, Stuart Davies said: “We were delighted to learn we were going to be getting a visit from royalty. It was a pleasure to see both residents and staff having fun and showing off their artwork“. cARTrefu, which means to reside in Welsh, is a four year programme which aims to improve access to quality arts experiences for older people in residential care. 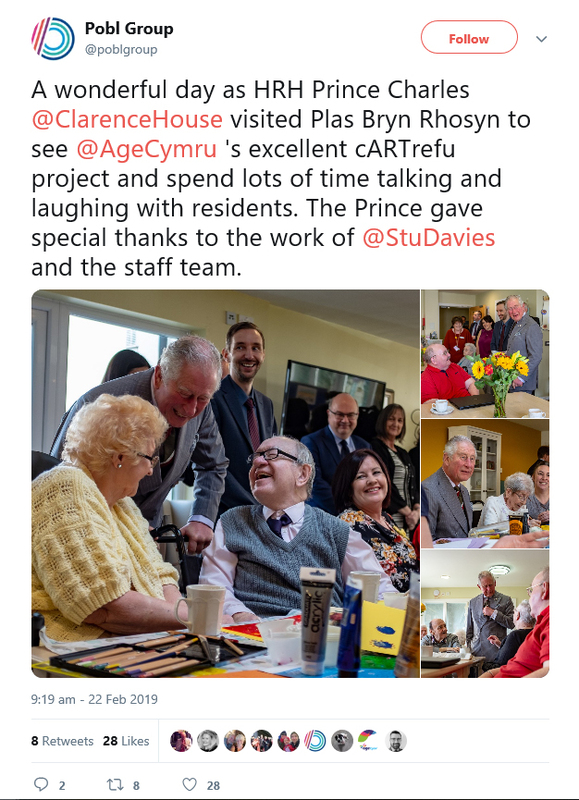 Following the Prince’s visit, Age Cymru officially released their new cARTrefu project video which stars residents and staff from Plas Bryn Rhosyn. It was filmed by Welsh Bafta winning director Clare Sturgess and produced by Age Cymru to promote the impact of creativity in care homes through the cARTrefu project.